A vest is always an essential piece in my wardrobe to wear as a base layer, especially under short/cropped jumpers and sweatshirts and sheer tops. It can be a plain, close-fitting sporty style or sometimes I like to wear a more luxurious and pretty camisole. 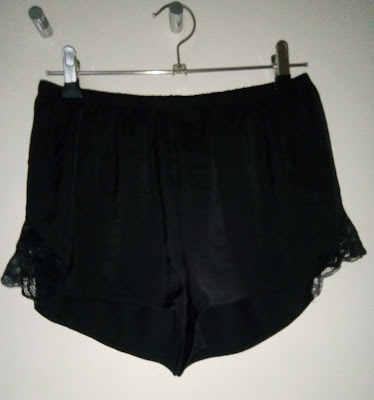 As I needed a couple of new vests, I was looking around in H&M and found this lovely black camisole and shorts set in their lingerie section. H&M actually sell the set as pyjamas. 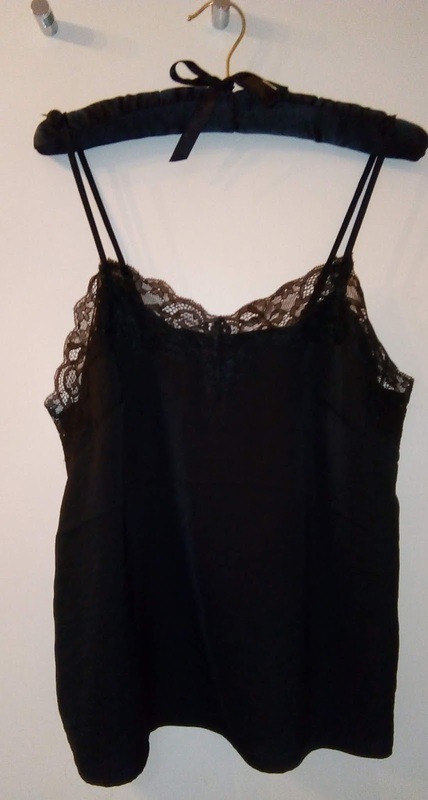 Made in a polyester soft satin material, the camisole is trimmed with lace at the top and the matching shorts have lace insets at the sides. I like the adjustable shoulder straps on the camisole. I bought the set to sometimes wear as pyjamas but I also intend to use the camisole as a layer in the daytime. Lingerie - 18th Century Lingerie - was the influence for the beautiful dresses in the recent CHANEL Haute Couture Spring/Summer show in Paris. Karl Lagerfeld presented his collection at the Grand Palais against a background that resembled an Italian Garden. Flowers were an important feature and hand-painted ceramic flowers were attached to dresses. Little pointed-toe, sling-back ankle boots with high, thin heels were worn with all the collection. The models wore their hair swept up in very high hairstyles which echoed the shape of 18th Century wigs. The beauty look was dramatic - dark navy blue eye makeup and red lips against a porcelain complexion. CHANEL's Les 9 Ombres Edition No. 2 Quintessence and Stylo Ombre et Contour in 02 Bleu Nuit were used for the eyes.